Asthma is sometimes thought of as a "childhood disease," but it is often diagnosed as a new condition in older people. For other people, it may be a problem that started early in life and continued into their senior years. Asthma is a common chronic disease of the lungs that affects people of all ages. With asthma, the airways are inflamed (swollen) and react easily to certain things that irritate (bother) them, like viruses, smoke, or pollen. 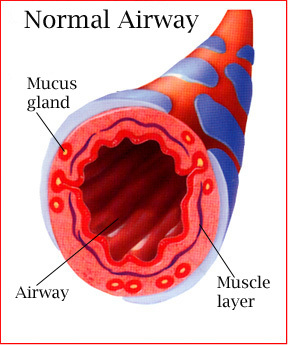 When the inflamed airways react, they get narrow, and make extra mucus so it becomes hard to breathe. Common asthma symptoms are wheezing, coughing, shortness of breath, and chest tightness. When these symptoms get worse, it's an asthma attack. Asthma symptoms may come and go, but the asthma is always there. To keep it under control, you need to work with your doctor and keep taking care of it. If you have asthma, you are not alone. In Michigan, asthma affects nearly 10% of adults and an estimated 6% of residents aged 65 and older. Some people develop it late in life. For others, it may be a continuing problem from younger years. The cause is not known. Asthma in older adults presents some special concerns. For example, the normal effects of aging can make asthma harder to diagnose and treat. So can other health problems that many older adults have (like emphysema or heart disease). Also, older adults are more likely than younger people to have side effects from asthma and non-asthma medicines. You and your doctor must take special care to watch out for these concerns. The best way to do this is by having regular doctor visits. If you have any of the above symptoms, visit the doctor to have a complete check-up. It could be asthma or another medical problem. Several tests may be needed to tell what is causing your symptoms. These tests include spirometry (a breathing test to measure how much air you can breathe in and out, and how fast), a chest x-ray, an electrocardiogram (to show whether you have heart disease), and a blood test. Accurate diagnosis is important because asthma is treated differently from other diseases with the same symptoms. Maintain normal activity levels, including exercise and other physical activities. Have normal or near-normal lung function. Be satisfied with the asthma care received. Have no or the least side effects while getting the best medications. You can help keep your asthma under control if you do a few simple things. Tell your doctor or asthma educator about any concerns you have about your asthma, your medicines, and your health. Be honest about any problems you may have hearing, understanding, or remembering things your doctor tells you. If you take medicine that you must inhale, check with your doctor to make sure that you are taking it right. Health problems such as arthritis may make it difficult to take your medication. A spacer (a valved holding chamber attached to the inhaler, click here to see what they look like and how to use them) may make it easier to take your medication. Your doctor can help you solve any problems. Repeat back to your doctor what you think you are supposed to do. It's also important to talk to your doctor about all the medicines you take--for asthma and for other problems--to be sure they will not cause harmful side effects. Be sure to mention eye drops, aspirin, and other medicines you take without a prescription. Learn about non-asthma medications that may cause trouble in the treatment of asthma in seniors. Also, tell your doctor about any symptoms you have, even if you don't think they are related to asthma. 2. Ask your doctor for a written Asthma Action Plan. Then be sure to follow it. A written Asthma Action Plan will tell you when to take each of your asthma medicines and how much to take. If you have trouble reading small print, ask for your Asthma Action Plan (and other handouts) in larger type. 3. Watch for early symptoms and respond quickly. 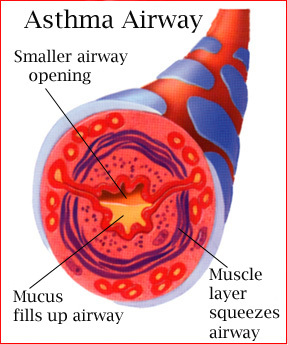 Most asthma attacks start slowly. You can learn to tell when one is coming if you keep track of the symptoms you have, how bad they are, and when you have them. Your doctor also may want you to use a "peak flow meter," which is a small plastic tool that you blow into that measures how fast the air is coming from your large airways. If you respond early to the first signs that your asthma is getting worse, you can prevent serious asthma attacks. It is really important to pay attention to your symptoms because your peak flow can be normal even when your asthma is getting worse. 4. Stay away from things that make your asthma worse. Triggers are things that make your asthma worse. Triggers can cause the airways to become swollen, tightened, and plugged up due to extra mucus. What causes asthma to flare up in one person, may not have the same effect on another person with asthma. Learn more about triggers and ways to avoid them. 5. See your doctor at least every 6 months. You may need to go more often, especially if your asthma is not under control. Regular visits will let your doctor check your progress and, if needed, change your treatment plan. Ask about getting a flu shot and a vaccine to prevent pneumonia. Your doctor can also check other medical problems you may have. Adapted from the Guidelines for the Diagnosis and Management of Asthma, National Asthma Education and Prevention Program of the National Heart, Lung and Blood Institute, 1998.